Odds are you’ll either love it or hate it. 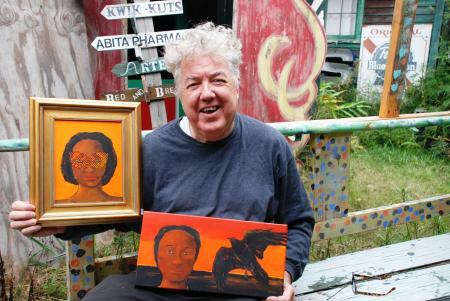 There’s not much middle ground for visitors to the Abita Mystery House, an explosion of oddball collections, art and humor are thrown together like the ingredients to some kind of great cosmic gumbo. You get it. Or you don’t. That’s okay with John Preble, the mad scientist stirring the pot: he gets his jollies – and his three bucks admission – either way. 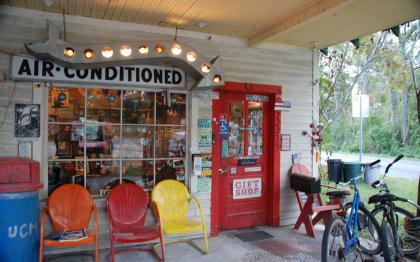 Formerly known as the UCM Museum (a Preble joke, as in you-see-‘em), the folk artsy roadside attraction has been welcoming visitors since 1993 when Preble turned a vintage gas station, old barn and Creole cottage into the town’s second most popular tourist attraction (Abita Beer’s brewery tours being number one). Filling the structures, and green spaces in between, with more than 50,000 found objects (“brick” phones, transistor boards, paint-by-number scenes, bottle caps, arcade games …) and his own art, Preble created an altered-states kind of universe where you never know what’s around the corner or through the next door. An artist as much as impresario, he also uses his talent and wicked humor to create clever diorama takes on Southern life, witty signage and bizarre critters. Meet Darryl the Dogigator (half dog, half gator). Peer in on the resident alien spending his Earthly days in an Airstream trailer. Learn about the Honey Island Swamp Monster. Visitors to the Abita Mystery House come from all over, some stumbling across it as they drive through town, others following some high-frequency beacon all the way from places like Japan, Canada and the Czech Republic. The AMH has been included on TV shows like “American Pickers” and “Mysteries at the Museum,” only enhancing its allure.